We were surprised when British Airways (BA) offered the cheapest flight in November 2007, but since then they've so regularly come out cheapest that now it's more a delight than a surprise - what better way to travel than to pay the lowest price for the best ride. Currently costing R550, British Airways flight BA6426 is scheduled to leave Cape Town at 1800 on the 9th May and touch down at Johannesburg OR Tambo at 2000. 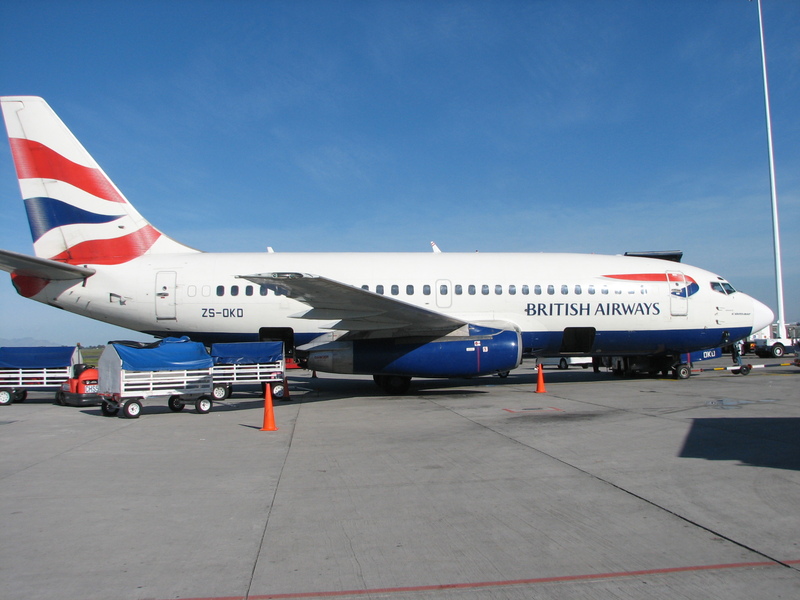 Comair runs both the British Airways and the Kulula brands in South Africa. As can be seen in the table above British Airways is easily the cheapest (R550), whilst Kulula.com and Nationwide Airlines are neck and neck for second cheapest flight. The Mango promotional code is still working. The R741 price mentioned above is the price without using the code. If I use the code "PNMS01" when making the booking Mango Airline's price drops to R638 (still not quite the cheapest price, but 15% cheaper than their price without using the promotional code). If you make a Mango booking, please remember to use this promotional code. Traditionally, Kulula has been the low cost carrier in the Comair group and BA the full service more expensive carrier. However, BA is so often cheaper than Kulula, that one has to wonder what strategy Comair are following. The greenest (i.e. most carbon friendly) way of getting from Cape Town to Johannesburg is by bus, and this week City to City has knocked SA Roadlink off its perch, offering the cheapest bus trip from Cape Town to Johannesburg. This is the first time in our surveys that SA Roadlink hasn't been cheapest on Cape Town to Johannesburg bus trips. The City to City bus is scheduled to leave Cape Town at 1100 on the 9th May, and arrive in Johannesburg at 0515 on the 10th May. Once you get to Joburg, you may want to hire a car (as usual our survey shows that Tempest car hire are the cheapest). Note that First Car Rental is the old National Alamo Car Rental (they had to change their name because Europcar purchased the rights to the National and Alamo brand names). We focus our search for hotel accommodation in Johannesburg on Johannesburg International Airport, as many people want to spend the night there whilst they are in Johannesburg. Hotel prices are pretty stable, only the Melrose Hotel increased the cost of a night's stay since our last survey, from R1870 to R2070. The following picture is of the Air Traffic Control (ATC) tower at Cape Town International Airport, with its golf ball shaped top. On the ground below we can see Cloud 9 Air Charters and a Nationwide plane parked there. In the background is the side-on view of Table Mountain, with Devil's Peak on the right (and on the bottom of the plane you can see the wing of the airbus within which this photo was take). The photo was taken on Friday the 25th January 2008.
the highlight for him of going to the lion park was patting the lion cubs (yes, for me too when I visisted the Lion and Rhino Park). Aer Lingus is "Ireland's highest fare airline"
"Ryanair is now twice the size and just half the price of Aer Lingus here in Ireland, and has long displaced any claims Aer Lingus might have had to being Ireland's national airline. Aer Lingus's only remaining title is that of Ireland's highest fare airline. Aer Lingus can't compete with Ryanair's prices, they cant match our punctuality, and now they can't match our route network from from Dublin to the UK or Europe." Michael O'Leary (the leader of the pack at Ryanair airline ), as quoted in the his biography: "A Life in Full Flight: The story of the man who made Ryanair take off".